Our teacher made us race cars from a cardboard boxes. We will use them for our Sports Day drag race! We’re getting ready for sports day. Today we got into our yellow and white teams and practiced for the Tug-of-War. It was fun. Sunday, September 29th is Apple Bee’s Sports Day. Today we started making a sign for our sports day using our handprints and footprints! We hope you like them! 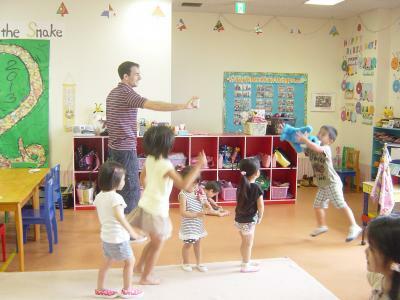 Apple Bee’s second term began this week. We are so happy, everyone is getting bigger! This term we have many events planned, like sports day, halloween, potato digging, Christmas party…etc. Let’s have fun and enjoy ourselves. Today was the last day of Summer School for this year, and we reviewed what we learned. We sang songs, danced, and then we did our favorite thing, cooked! 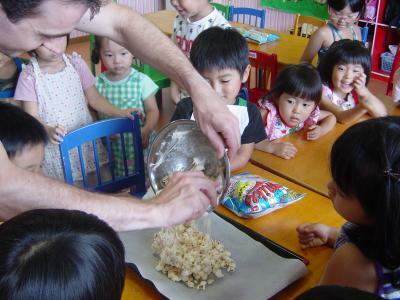 We made delicious marshmallow popcorn treats! We melted marshmallows and butter, then mixed in some popcorn. Marshmallow treats are easy to make, and very yummy! You shoud try it! Today we read the story of the Little Red Hen, then we made finger puppets of the characters. Today we learned about rare animals in the world and made our own yetis, who live in the Himalayan Mountains.They are very hairy and can walk on two legs. 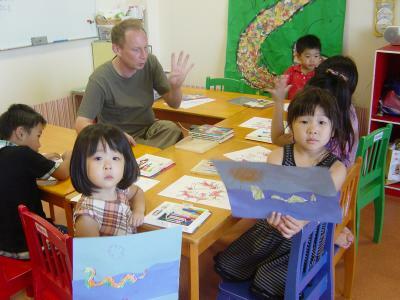 This week for summer school we are studying “World Animals and Mysteries”. Yesterday we learned about Sasquatch, and today we studied about the Loch Ness Monster. We made pictures of it at art time. Summer School Fridays are cooking days! Today we made delicious Mexican tortillas! We mixed flour, salt, bakingpowder, shortening and hot water and heated our mixture on a hotplate. 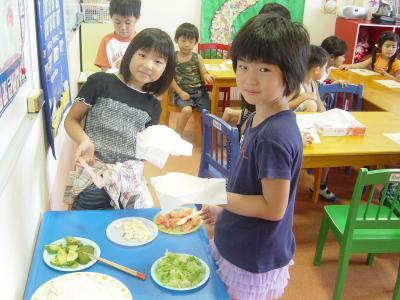 After they finshed cooking, we decorated our toritillas with lettuce, tomato, avocado and cheese. We are learning that there is a lot of delicious food in the world. 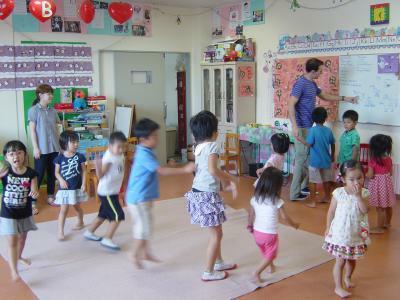 Today we studied about Asia. 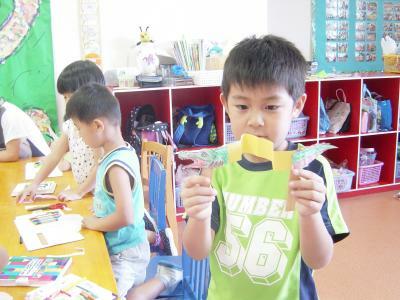 We also learned greetings from around the world, and at art time we made chinese dragons. Today we studied about Africa. 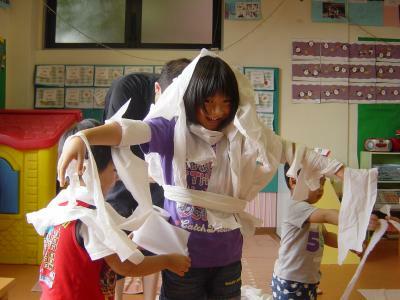 We made Kenya’s flag and pyramids then we turned ourselves into Mummies using toilet paper. It was so much fun! 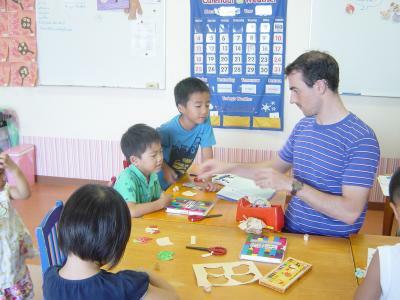 This week for summer school we are studying “World Cultures”. Yesterday we learned about South America, and today we studied Europ: country names, famous landmarks, flags, and map locations.Studying foreign countries is fun. One day we hope to have friends from all over the world! Summer School Fridays are cooking days here at Apple Bee, and today we made delicious crape! We mixed eggs, flour, milk and butter and heated our mixture on a hotplate. After they finshed cooking, we decorated our crape with banana and chocolate. We love cooking days and eating crape! Today we played a circle guessing game with our teacher. He played music, and when he stooped the music he asked us a “What’s this?” question.Circle games are a fun way to memorize new words!